gRPC is a high performance, open-source universal RPC framework, developed by Google. In gRPC, a client application can directly call methods on a server application on a different machine as if it was a local object, making it easier to create distributed applications and services. One of the primary benefits of using gRPC is for documentation; you can use your service configuration and API interface definition files to generate reference documentation for your API. See Developer Portal Overview for more information. 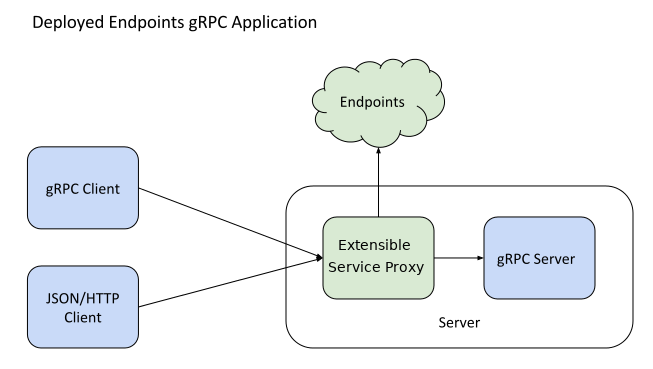 Endpoints works with the Extensible Service Proxy (ESP) to provide API management. With Endpoints for gRPC, you can use the API management capabilities of Endpoints to add an API console, monitoring, hosting, tracing, authentication, and more to your gRPC services. In addition, once you specify special mapping rules, ESP translates RESTful JSON over HTTP into gRPC requests. This means that you can deploy a gRPC server managed by Endpoints and call its API using a gRPC or JSON/HTTP client, giving you much more flexibility and ease of integration with other systems. You can create gRPC services for Endpoints in any gRPC-supported language. You can find out much more about gRPC, including quickstarts and tutorials for creating servers and clients, on the gRPC site. A container in Google Container Registry. See the ESP release notes for the current Docker image. Source code in GitHub. See the ESP README for details on building ESP. See Deploying the API Backend for information on deploying your API and ESP on GCP compute platforms. gRPC is based around the idea of defining a service, specifying the methods that can be called remotely with their parameters and return types. By default, gRPC uses protocol buffers as the Interface Definition Language (IDL) for describing both the service interface and the structure of the payload messages. To use gRPC with Endpoints, you must provide a service configuration along with the service definition. This configures the runtime behavior of your service, including authentication, the API(s) included in the service, mappings from HTTP requests to gRPC methods, and special Cloud Endpoints settings. Endpoints provides protocol translation for your gRPC services allowing clients to use HTTP/JSON to communicate with a gRPC service through the Extensible Service Proxy. The most common use case is allowing browser clients to talk to gRPC servers without special support from gRPC server libraries. Endpoints provides a mechanism for mapping HTTP requests to gRPC methods as part of service configuration. You can find out more about this in Transcoding HTTP/JSON to gRPC. Endpoints doesn't support App Engine environments for gRPC services, only GKE and Compute Engine are supported.